May 25, 2018 – This weekend is always a hit and miss one in Seattle. Will we get rain…sun…a mix? Will a monsoon suddenly descend upon the region? Well, regardless of what Mother Nature may have in store for us (and right now it looks pretty good! ), there’s no denying that this weekend is the unofficial start to Summer 2018. If you’re having friends and family over and have a hot tub, I hope you’ll be incorporating it into the festivities. It’s always wonderful to share time in your hot tub with the gang. 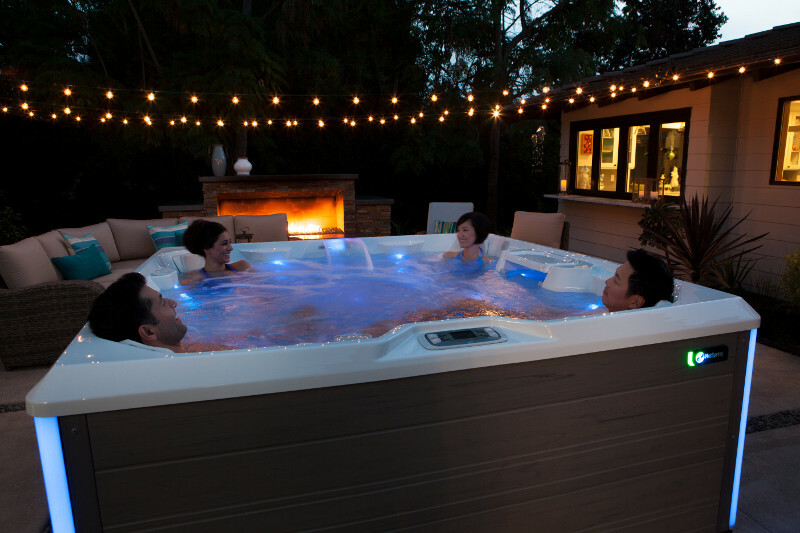 If you’re going to make hot tubbing part of the fun, here are some things to think about to make sure it’s a hit. Check the water. Make sure the tub is topped off with fresh water, chemistry is balanced, and you have proper sanitizer in the water for everyone soaking. After a group soak, it’s always best to add an extra dose of sanitizer and run the jets for 30-45 minutes to make sure the tub stays clean and sanitized for the next group of soakers. If it’s been a while since you’ve drained and filled the tub completely, now’s the time to get it done. At the end of the day, a dose of shock and a small amount of clarifier will keep things smelling fresh and the tub water clear. Clean the filters. Clean filters are a key component to clean water! Make sure the filters are thoroughly cleaned and ready for the extra bathers. Break out the fruit. Fresh fruit is so satisfying when you’re soaking during the daytime. I love tangelos, grapes, slices of watermelon, honeydew, cantaloupe, strawberries…they’re all so yummy and refreshing out by the tub. They’re also full of water to help with hydration. Add aromatherapy. Our line of Spazazz Aromatherapy is a lot of fun to add to the water with groups. Some folks have never experienced hot tubbing with a great fragrant scent to enhance the soak. We love it because it also won’t cause foam or mess with water chemistry. However you choose to spend the weekend, I hope you’re safe, happy and healthy. And, take the time to remember those who sacrificed much for our country and our freedom. They deserve our thanks and recognition every day, but especially on Memorial Day.